On Thursday 10th May 2018, under the patronage of His Excellency Salim Al Aufi, STS celebrated the graduation of their second cohort of 43 Omani Graduate Development Program participants. Along with the first cohort of 54 employees who graduated in March 2017, STS is proud of the 97 Omani employees who have successfully completed the program to date and welcomes many more who are enrolled on the program and those who will be inducted in the coming months. In attendance at the graduation ceremony were His Excellency Salim Al Aufi, STS CEO Alex Clark and many Senior Executives from PDO and STS. 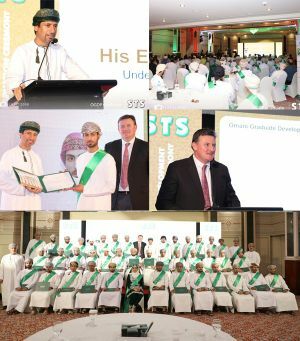 In 2013, STS launched the Omani Graduate Development Program (OGDP) as a result of a number of factors most importantly, the belief that long-term sustainability is dependent upon a skilled and motivated graduate workforce who are able to contribute to the success of the organisation and develop into the leaders of tomorrow. STS’ commitment to ICV saw the growth and development of newly qualified graduates as a natural progression to its training and development program aimed at Trade and Technician Levels. STS also recognised a desire from our graduate employees, who were fresh out of the tertiary education system, to participate in additional training and development to help them prepare for and succeed in their chosen career. His Excellency Salim Al Aufi, spoke passionately at length about the need for young Omanis to dedicate themselves to lifelong learning and working diligently to earn their promotions and improve their career paths. He described his own career growth and the hard work it had taken to get to where he is today. Currently there are 54 employees participating in the OGDP program in both operational and support roles and plans are in place to enrol a considerable number of Graduates during 2018.